Screen shots from the NoiseCapture application. Credit: CNRS-IFSTTAR. Anyone who owns an Android smartphone will soon be able to contribute to a research project simply by recording surrounding noise. The purpose is to establish a participatory map of the sound environment. The NoiseCapture application, which was developed by researchers from the CNRS and IFSTTAR, uses signal processing algorithms to calculate acoustic indicators during the user's trips. These geolocated indicators are then anonymously stored in a database to develop noise maps that reflect reality as closely as possible, with extremely dense connections. These noise maps obtained via smartphone data could be used by local governments to implement more targeted plans of action for preserving or improving the quality of urban sound environments. 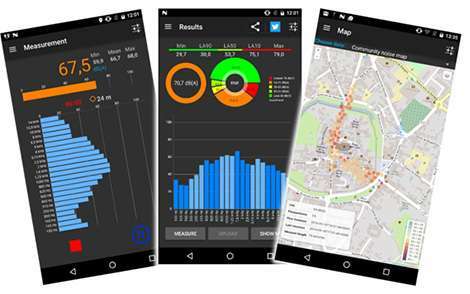 The NoiseCapture application, which was developed within the framework of the ENERGIC-OD European project, is a participatory project that brings together specialists in environmental acoustics and geographic information, thereby enabling researchers to address major issues such as interoperability or the qualification and handling of data from various sources including noise level, cadastral data and statistical data on populations. The NoiseCapture application is accompanied by a comprehensive information system that can store, query and share the collected data. This geographic information system now functions in real time, and will enable the creation of a permanent database on a global scale. Beyond scientific considerations, which raise questions about the analysis of data quality and the creation of indicators or new mediums for the rendering of results, the researchers were driven by a desire to open up research on the sound environment to the broadest possible audience. This opening is reflected in an "open science" project, with the development of shared resources under an open source license, the diffusion of anonymous data collected under an open data license, and the publication of research results in open access journals. 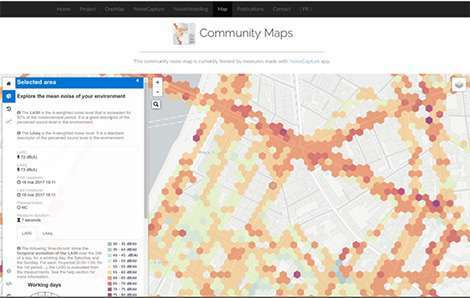 Screen shot of the collaborative cartography available on Noise-planet.org, the community site for the NoiseCapture application. Cartographic representation of average sound levels measured in the city of Lyon. The colors represent intervals of sound levels. Credit: CNRS-IFSTTAR. The research of the two teams is a good example of a citizen-based approach to science. The goal is to use the NoiseCapture project to involve citizens in the control of their territory, notably in matters of noise pollution, a prerequisite to allow them to be actors in improving the quality of their environment. The NoiseCapture application will be presented to the public during Digital Week, which begins on September 24, 2017 in Saint-Nazaire (northwestern France). It will be available as of September 1 on all Android telephones.